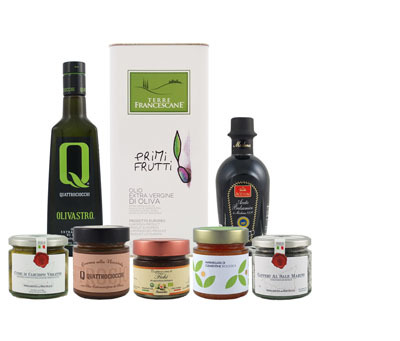 This set of five agrumato flavored oils: Garlic, Lemon, Basil, Peperoncino, and Orange, from Olio Guglielmi are obtained from the simultaneous milling of locally farmed olives, herbs and citrus, which results in a 100% natural and wonderfully aromatic oil. The flavors of these oils find their best use in the kitchen in both the preparation phase as well as using raw for finishing. They are particularly excellent in marinating raw fish and game, as well as seasoning grilled fish, meats and salads and in preparing desserts and pastries.